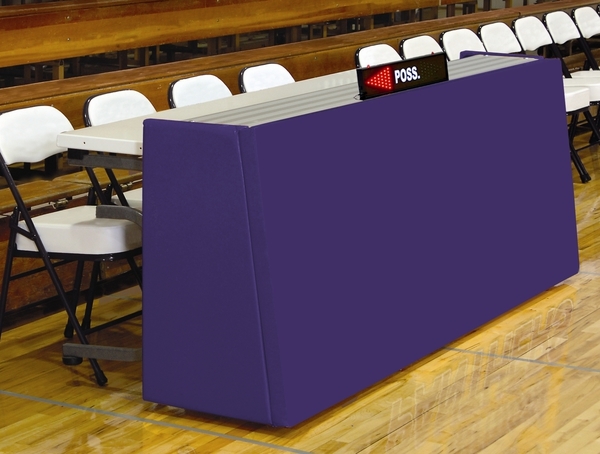 The Sport Pride™ 8-ft. Scorers Table folds easily for transport and storage. 16 color options! The Sport Pride™ 8-ft. Scorers Table folds easily for transport and storage. Folding 16" deep tabletop with cup holders. Padded front and sides have 14-oz. anti-mildew, UV-protected and fire-retardant vinyl over 2" thick foam. Steel and aluminum structure with powder-coated and anodized finishes. 110 volt receeptacles for computer, shot clock, etc.